It isn't easy for retailers to align around customers and brands rather than sales channel, but the effort is worth it. 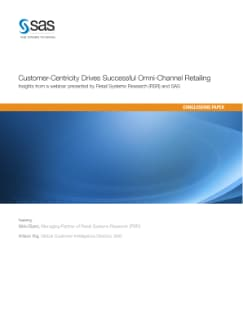 Cross-channel shoppers are significantly more profitable than single-channel customers – 38 percent more profitable this year versus last, according to Retail Systems Research (RSR). In a SAS-sponsored webinar, Nikki Baird of RSR joined Wilson Raj of SAS to discuss the "Five Cs" of marketing, why the sales funnel is obsolete, how to capture the "haggling data" for the softer side of purchase decisions and how to keep your insight-driven marketing from being "creepy."